DNN Article is not only a powerful module to enable post and manage articles, but also provides total solutions for content management. Content such as articles, news, announcements, product catalogs, etc can be organized into unlimited levels of categories. New content can be moderated before published. The administrator can assign roles as moderator. Also an email can be sent when new content is added. Visitors can make comment and rating. They can also agree or disagree an article. The product supports common features of DotNetNuke module such as localization, portable interface, search, Syndication etc. It can integrate with Twitter, Facebook, Google Map, Windows Live Writer and DotNetNuke Journal to provide more powerful functions for your portals. DNNArticle is an extendable system. There are several sub modules shipped with DNNArticle standard edition to provide rich and attractive look and feel experiences. 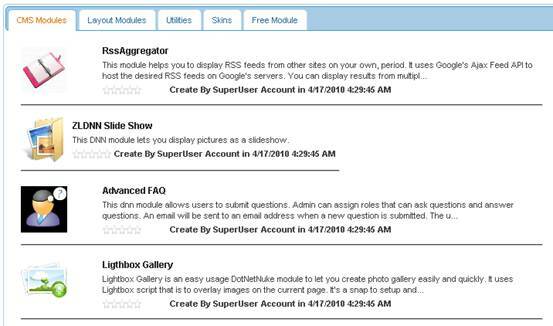 There are also several optional sub modules that provide more features. And the number of optional sub modules is growing continually. There are also several applications based on DNNArticle such as DNNArticle Blog and DNNArticle Product. DNNArticle fully supports template and CSS theme. This feature provides more flexibility for users to build more attractive user interface. The version 11 can work with DNN 7.1+ including DNN 8.x and DNN 9.x. Now it's Telerik controls free. There are showcases in the showcase page: http://www.zldnn.com/ShowCases.aspx. If you're using DNNArticle and want to add your web site to the show case page, you can submit it in the page too. You can download 15 days trial version and user guide from this page. You can see the show cases of DNNArticle: http://www.zldnn.com/ShowCases.aspx . And you can submit your web site as show case in the page. All contents are organized by category. It supports sub categories. You can create sub categories as many as you want. An icon can be set for each category. The article category sub module can show categories in tree view. An article can be assign to more than one category. A category sub module can display categories in any page you want. You can define tags and assign an article to several tags. Tags can be shown in Tag Cloud sub module. Permission: It integrates with DotNetNuke Module Permission. Who can view attach files? Who can make comment and rating? Authorized authors who can manage their own articles and their articles can be published automatically. Authorized users/roles can submit article. Editors and/or Authors can modify submitted articles. Moderators can approve articles to be published. 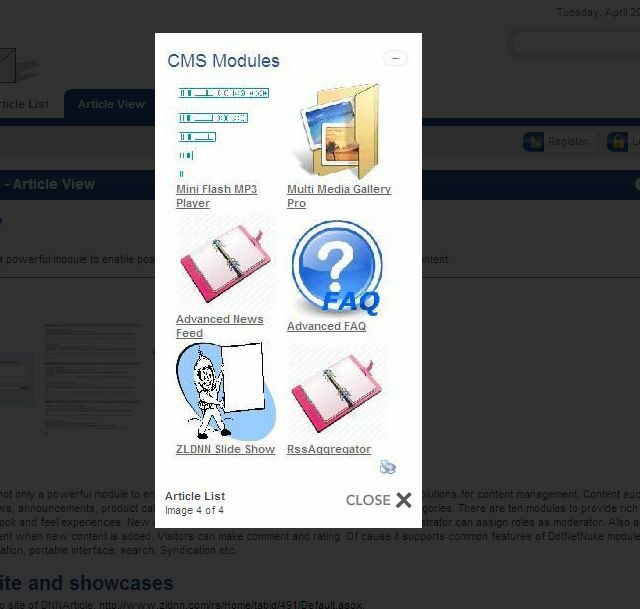 Administrators can define view permissions of article modules, categories and articles. Authors can define view permissions of their own articles. Article view permission will override categories view permission. View permission check can be in article list or article view. That means you can allow unauthorized users to view article list or not. You can add custom fields such as Textbox, HTML, Dropdown List and Number. Custom Fields can be add to DNNArticle Editor template as normal fields. Custom Fields can be displayed as normal fields. You can define the template of subject and body of Email notification. Email Notification can be sent when articles are posted, approved to moderators and authors. Comment Email Nofitication can be sent to comment moderators. Facebook Integration: Post new article or article update message to Facebook profile or Facebook page. The powerful token system of DNNArticle makes the flexible Templates and Themes possbile. Basic Tokens: All fields of article, category and comment can be used as token. For example, [TITLE], [DESCRIPTION],[CONTENT] as so on. [IMAGE] and [THUMBNUALIMAGE]: The image tokens can show image or thumbnail image of the article. Formatted Tokens: There are several formatted tokens that can make fields formatted. For example, [DESCRIPTION:length] can show shorten description. [PUBLISHDATE:MM/dd/yyyy] can show publish date in the format MM/dd/yyyy. Condition Block Tokens: The are several condition block tokens such as [ISFEATURED]..[/ISFEATURED], [NOTAPPROVED]..[/NOTAPPROVED]. [CANVIEW]..[/CANVIEW],[CANNOTVIEW]..[/CANNOTVIEW]. The condition block token will show HTML in the block if condition is true. For example, [ISFEATURED]..[/ISFEATURED] will show content in the block if the article is featured. [IFEXIST:fieldname]...[/IFEXIST:fieldname] and [IFNOTEXIST:fieldname]...[/IFNOTEXIST:fieldname] block Tokens: The tokens will show content in the block if the field is exist or not exist. [ISINROLES:role1;role2]...[/ISINROELS]. It will show text in block if current user is in roles defined in the token. [NEXTARTICLE:categoryid,vieworder] template of next article [/NEXTARTICLE]” and “ [PREVARTICLE:categoryid,vieworder] template of prev article [/PREVARTICLE]” for detail view template. Control Tokens: There are several control tokens such as [AGREE],[MAKERATING],[MAKECOMMENT],[COMMENTLIST] that can provide complex functions for DNNArticle List and DNNARticle View. Google Map Tokens: It can show google maps in DNNArticle List or DNNArticle View. Related article token [RELATEDARTILCE:orderfield,categoryid,title] that can show related articles from one category. Attachment token can show list of attached files in DNNArticle List and DNNArticle View. [ODDEVENROW] token to DNNArticle List. It will generate “odd” and “even”. You can use them to generate different CSS classes for odd and even rows. [CURRENTCATEGORY]...[/CURRENTCATEGORY] in header/footer template for DNNArticle List. [ARTICLES]...[/ARTICLES] in header/footer template for DNNArticle List. All fields and custom fields can be added in editor template. There are also several tokens that can generate edit controls not included in standard editor. The DNNArticle Editor supports fields permission that integrates with DNN module permission. You can define steps for editing. You can define template for layout of steps. There are built in step template shipped with the module. Fully supports template.The token system of DNNArticle provides more flexiblity for creating attractive UI. The Theme Selector can help you to create template easily. There are several built in Theme shipped with the product. Pagination support: You can enable pagination and set page size for main DNNArticle module and Article List sub module. Sort Options: Articles can be sorted by fields such as created date, view order, clicks, or title. You can set thread or flat Comment style. Visitors can like or dislike a comment. Visitors can reply to a comment. The Make Comment and Comment List controls can be added to template by [MAKECOMMENT] and [COMMENTLIST] tokens. The comment list fully supports template. The Recent Comment optional module can show comments from all articles. Visitors can submit 5 stars Rating. The Make Rating control can be added to template by the token [MAKERATING]. Visitors can agree or Disagree an article. The Agree/Disagree control can be add to template by token. Site Map: Support DotNetNuke SiteMap interface. The businesses can be added to DotNetNuke Site Map automatically. Article Search There is a sub module for searching articles. The display template of search result can be defined. Article List There is a sub module to display article list. By using it, an Article can appear in multiple places within your site. The display template can be defined. Article Slider Article Slider is a sub module to make a slideshow out of articles on your page. Users can manually select a content to see or have them rotated automatically. Pagination links let the user quickly pick a content to show. Tabbed Content Tabbed Content is a sub module to display articles as tabbed type. Users can manually select a content to see or have them rotated automatically. Tag Cloud From 4.2 there is a new sub module named tag cloud. You can define and assign tags to your article. The Tag Cloud module will generate tag cloud of the article module. You can define the CSS of tag by popularity. 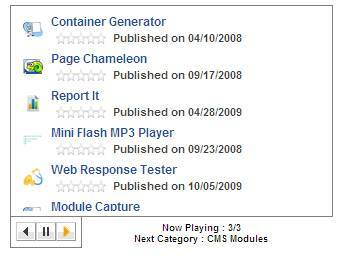 Article Category Show categories of a DNNArticle module in any page you want. Article Archive module Show archived articles by month or by year. Category Article List Show categories and articles in flat style. User Articles Show articles of a user. There are several optional modules of DNNArticle. You can purchase "with optional moduels" edition to get more features. RSS Importer: Import RSS feed into DNNArticle. Advanced Search: it allows users to search articles by categories, date range etc. Admin can define the UI by template. Dashboard: it allows admin to manage articles easily. DNNArticle Editor: it allows you to define editor UI by template. RecentComments: show user comments of a DNNArticle instance. DNNArticle Add Article: It can create a “Add Article Link” that can lead you to the page of adding article. 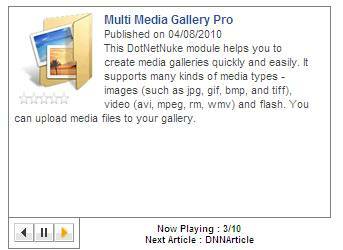 It can help you to create articles for related entries such as DNN Social groups. DNNArticle Advanced Comment Management: It’s an enhanced comment management sub module that allows comment moderators to manage comments. It allows administrators to manage all DNNArticle instances in the portal. DNNArticle Management: It’s an enhanced article managent sub module that allows article moderators to manage articles. It allows administrators to manage all DNNArticle instances in the portal.